This quick & easy one-pot Punjabi rajma masala curry is super simple to make and loaded with rich and delicious flavors. 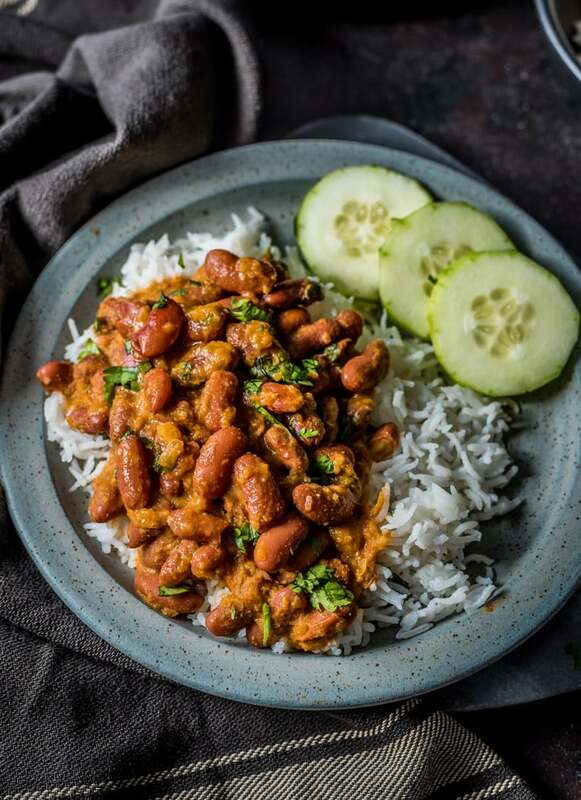 Rajma has been a family favorite of ours for years, and a regular weekday dinner. After you’ve made my recipe, I’m sure you’ll see why! Punjabi Rajma masala is a rich, flavorful curry made by cooking kidney beans (rajma) in an onion-tomato gravy. 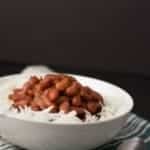 Rajma paired with rice is popularly called as rajma chawal and it is considered the ultimate comfort food just like the chili we make in the US. Rajma somehow evaded my taste buds until my early twenties. My mom is an excellent cook and introduced me to so many different dishes, but she was born and raised in the southern part of India where rajma isn’t very popular. She did try it. Once. When my mom moved to Mumbai to get her college degree, she was welcomed by her classmate the way Mumbaikars (residents of Mumbai) typically do – by sharing food which in her case was with some delicious looking home cooked Rajma masala. That was her first and last experience of rajma. You know how, usually, it’s a good idea to go easy on the garam masala? Half a teaspoon here, maybe a teaspoon there. This recipe used it by the cup. At least my mom claims that it tasted like that. It’s safe to say that my mom never had the urge to eat rajma after that. Luckily, I was introduced to rajma by someone who knew how to cook it well. My north-Indian roommates whom I lived with when I moved to the USA had a great recipe. I got hooked after my first mouthful, and I have made it over and over again since. It’s a family favorite and, best of all, it convinced my mother that rajma wasn’t the horrible dish she thought it was! There are lots of recipes for this famous Punjabi curry, although you won’t need them after you’ve made my Dhaba style rajma! Scroll down for the recipe, meanwhile, I will quickly answer some frequently asked questions. How many hours do you need to soak Rajma? I usually soak rajma or kidney beans overnight for 8-10 hours. Forgot to soak kidney beans? Here’s what you can do. Traditional pressure cooker – If you are using a traditional Indian pressure cooker like this one, pressure cook till the vent goes off 7-8 times before switching off heat. Let the pressure cooker cool down naturally before opening the cover. Use canned kidney beans – Drain off the liquid and thoroughly rinse it before using. Using an Instant Pot – Rinse the kidney beans before adding it to the Instant Pot. For every cup of dried kidney beans, add 2 cups of water and 1/2 a teaspoon of salt. Pressure cook for 4 minutes on high using the manual mode and wait until the “keep warm” timer has reached 10 minutes. Press Cancel and twist the steam release handle on the lid to “venting” position. How long does it take to pressure cook rajma or kidney beans? Traditional pressure cooking vs Instant Pot cooking – Which one is better? Keep warm function – The obvious reason I love this feature is when the pressure cooking is complete, the Instant Pot switches to the “Keep Warm” function which keeps the food warm till we are ready to eat. How to make Punjabi rajma masala curry? Rinse the soaked kidney beans and pressure cook it over medium heat it with 3 cups of water and 1/2 a teaspoon of salt (I cook the kidney beans in the pressure cooker till the vent or whistle goes off 4 times). Set it aside to cool. Add green chilly, coriander powder, cumin powder, garam masala, salt, chilly powder to this mixture and mix well. Add the cooked kidney beans to it and a little water (if needed) and let it simmer for 10 minutes. [ Sometimes I add the tomato-onion gravy to the in the cooker and let it cook some more (till the vent goes off once) to make it soft and mushy. Serve with either chapatis or steamed rice. Add oil in the steel insert of the Instant Pot and press the Saute function. Press the Adjust button to move the selection to "low" and wait till the display reads "Hot." Add onions. Fry the onions till they turn soft and translucent (approximately 12-15 minutes). Add the green chilly, coriander powder, cumin powder, garam masala, salt, chilly powder to this mixture and mix well. Add the soaked and rinsed kidney beans to it along with 3 cups of water. Press "Warm / Cancel" button and then select "Pressure Cook." Adjust the time to 20 minutes and set the pressure selection to high. Cover the Instant Pot lid and lock it. Make sure the vent is at sealing position. Wait until the Vent returns to the venting position to check on your kidney beans curry. You could serve it immediately or let it slow cook on low for an hour or two to get the slow cooked taste we all love. Serve it with steamed rice or chapatis. Set it for 10 minutes and let the pressure release naturally. By the way, I like your website and your style of writing and presentation of the recipes! Stumbled on to your excellent website while looking for calories in methi thepla. I’m glad I got here — can’t wait to try many of the things you have made. Re rajma, I’ve found that whether you’ve soaked them overnight or not, it works to give them two whistles and then let the cooker simmer for 15-25 minutes, depending on how much they’ve been soaked and the size of the seeds. The simmering also allows the flavors of the rajma and seasonings to blend wonderfully. I usually boil the rajma like this with salt, ginger, and red chilly powder first, then add the onion-tomato-garlic paste that you’ve mentioned above, and give it one more whistle. Thank you so much Pragya fpr your feedback. I will definitely try your suggestion out. I usually soak it for 8-12 hours. Even then sometimes the Rajma doesn’t cook. It primarily depends on the quality of seeds (I think). I soak and while cooking wait for 4 whistles which works most of the times. If it doesn’t I do it in increments of 2 whistles at a time till it cooks..
i tried preparing rajma with dry seeds and read online to soak for 8 hrs or put it in a cooker , i kept it in cooker i waited for 8 whistles till it is not boiled. so how many whistles need to rajma to boil?